You are probably thinking, "What could possibly be a downside of a quilt show?" Well my answer is SLEEP! You see, I find over the last few years, when I go to a quilt show, I can't sleep for days after. I guess the last thing I need is INSPIRATION!! So while at the show yesterday, this sweet quilt made by a guild buddy and friend, Jeanne Kaye, kept me going back to take pictures and just admiring it. It was quilted with red thread and a simple loopy and star motif. It hit me.... 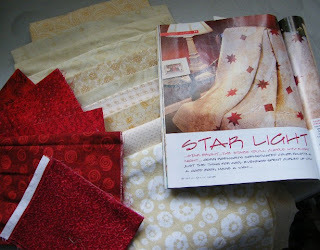 I've been collecting small bits of red, and I've been wanting to make a quilt out of neutrals. I need to make this quilt.. I woke up twice last night thinking about making that little red star quilt, then it hit me... I've seen that quilt before..... I could picture it in a magazine, sitting on my cutting table no less. Well I could hardly wait to get up this morning to go paw through my pile of quilt magazines. Sure enough, there it was... I had flagged it before. It's called Star Light and it's from a McCalls' 2005 quilt magazine. I've pulled my scrappy neutrals and reds out.... and before the end of the weekend, I'll have this a quilt kit cut and stored in a pizza box. 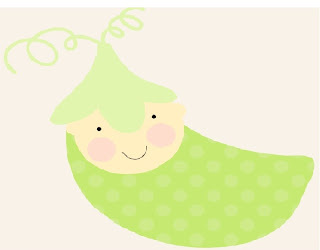 I know I've got 2 baby quilts to make before I make this one, so it'll be a great incentive to get the baby quilts done. Today is the last day of our guild's show, so try to get there. You won't be disappointed. 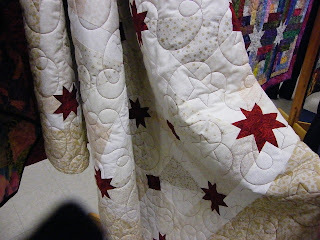 Linda H. took some time and photographed all the quilts from the show, so we'll put them in an album on the FQG blog soon, and you can look at them all. Would you like a ladybug with your tea? Are you coming to our quilt show? It's this weekend at the New Maryland Rec Center. The times are 10am - 8pm on Friday, and from 10am to 4pm on Saturday. Don't be surprised if you are offered a lady bug with your tea at the quilt show. There will be a little cafe at the quilt show with goodies made y the members of the guild. I've made 100+ small decorated sugar cookies. When we bought our summer cottage a few years back, it came furnished and the previous owners left some old blankets, curtains etc. We threw most of them out but I was reluctant to throw out this old woolen blanket. I took it home last fall with the intent to make over this blanket and give it a new life. So, this week, as we prepare to open the cottage for the summer, I dug out the blanket. I hummed and hawed over how to best manage it. Then while looking at the raggy ends, I decided surging them off was the way to start. I surged off one ragged end. The other end, that had a sizeable hold in it near the end. I surged off about 6 inches from that end. It's more square now than long, but I really like it. Just like a quilt, I made a 2.5" binding and added it to the blanket, just like a quilt. To complete the blanket makover, I re-stitched on the original label that was just hanging on by a few threads. The label says this blanket came from the Strathroy Woolen Mills in Ontario. I think I'm going to enjoy this blanket as we snuggle on the cool mornings at the cottage. I love a treat! And I love a surprise. Yesterday I got these 2 great quilt magazines from my daughter... Both magazines had great projects in them. I hadn't seen the Precut Magazines before, so I loved looking at that one. I think I'm almost sold on precuts, are you? For now, my plan is to precut my own kits out of my stash. I'll take a couple to the cottage to work on this summer. Thanks a bunch for the treat and surprise Carrie! Caitlin came to spend the day and night. See, she's been looking everywhere for a real sock monkey. They've come back in style. The ones you buy in stores now, are not made out of socks. They're made out of fabric and are not really what she wanted. So about a month ago, when we were on Skype, we discussed making her a real sock monkey. I said I would find some sock monkey socks in the USA and bring them back with me. I found the socks at Fabric.com. So Caitlin and I would like to introduce you to Mike... Mike the Sock Monkey. Here are some pictures. Mike and Caitlin showing off their tails. Grace came for an overnight visit. I'm glad be cause I had a lot of things to do and I could surely use her help. First off, Grace helped me cut out and sew a sundress for Aurora. Then she designed a fuzzy pillow. I totally forgot to take a picture of it but believe me, it was so cute. Before going to bed, we read some poetry out of "If I had a Million Onions" book. Then this morning after breakfast, we got right to work. While I was sewing, Grace ironed some of my Batik scraps. I'm getting ready to make up a kit of fabrics to take to the cottage so this is a big help to me. Then later in the morning, since I had to test out some cookies for our upcoming quilt show, she helped me with that. I'm going to use a Signature Sugar Cookie recipe and use fun spring icing colors to decorate with. Since she's a triplet, Grace loves having both beaters and the bowl to herself to lick off. Usually she has to share, with you know who!!!! So my little cookie test is complete. Grace and I used half a batch of cookie dough. I got just over two dozen cookies out of my small batch, and Grace got a little less. But I estimate I should be able to get 6 dozen small cookies out of one batch. I made small circle cookies, one-bite ladybugs, teapots and coffee cups. Since these are just samples, we can eat them up this weekend. I'll make the real ones next week. Thanks for all your help today Grace! Today was the first time Mitchell saw his finished Beach Birds quilt. He's very good in math. He knows his multiplication tables and soon figured out that each block in the center had 10 pieces of fabric. And he multiplied 11 blocks by 13 blocks. Then he counted up all the geese blocks that have 3 pieces of fabric each. After doing some paper math and some calculator math, he soon came up with a total of 1840 pieces of fabric in his quilt. Pretty smart, eh! I hope some of you get to see it at the FQG Quilt show next weekend. But in the last week of snowbirding in the south, I was at a flea market where a young man was custom printing t-shirts on the spot. He was taking images like cars, motorcycles etc and adding names etc on his computer, and printing with new hi-tech print with long lasting ink. That got me to thinking and I asked if he could keep the t-shirt and print on some plain cotton if I bring it myself. And he said, I guess so. I said I'd be back the next day. So, the next day, I went back, armed with a home made Jpg file that I designed using clipart that I had purchased a couple of years ago from Lettering Delights. The jpg page was 8.5" x 11" and I put 15 of the same small label on the page. He loaded my file into his computer, fit my plain cotton on to his T-shirt printer contraption, and pressed "Print". He was kind of scared and made me no promises, but I knew it would work. This is what I got. I was quite pleased.... On the label, all I put was "Made by" and my name. At the suggestion of some quilt buddies, I was advised to at least put the year, so next time I have labels printed on fabric, I will put in the year. It's a good suggestion. This morning, I took out my fine micron pen and added the year to these 2 projects that I labelled earlier this week. So, now the challenge to myself is to make 13 more small projects to use up these labels before I go south again next year. I had fun this morning making up this Posy Needle Wallet prototype from my new Sew Necessary book. Do you make prototypes of your small projects? I learned lots from making this sample. I used scraps from my stash, and I really like the outside colors. I think I would use different colors on the inside. I did make several small errors in constructing this, and I'll know better next time. Reading the directions very carefully would have helped!! I do intend to make a few of these Posy Wallets.. It's a nice size. About 6" tall when it's all folded up. I want to use it to tote all my hand quilting stuff to my Wednesday afternoon hand quilting group. While I don't have everything in it yet, here's what I intend to carry in my fully loaded Posy Wallet. I don't bring thread because we leave that with the quilt. Sew...What else would you tote to your hand quilting group? Home is where my stash is! We've been home from our snowbird trip for two days. I'm definitely loving re-connecting with my fabric stash. It just so happens that one of the guilds that I belong to is having a scrappy 9 patch day on Monday - tomorrow. So I'm having fun picking through all my scrappy bits and pieces to cut 2.5" squares. Here's my basket full of squares. I have no idea how many I've cut already but I need 500. I'll cut more this afternoon..
On the last hours of our drive home on Friday, I was so inspired by this Art to Heart Sew Necessities book that I had to stop one last time to get fabric. I picked up these spring and summery 8 long quarters on Friday to make some of the projects in this book. So, at the same time that I'm picking through scraps to cut squares, I'm also cutting out some pieces to make something from my new Art to Heart - Sew Necessary book. I think I'll start with this Posie Needle Wallet. I'll do a prototype first out of scrappy fabric, then once I get how this little pattern works, I'll make more out of my new fabric. I was thinking these needle wallets would be nice to make for the new hand-quilters who will work on the St. Anthony's church quilt starting in September. It will easily hold a little pair of scissors, a thimble, a pack of gum, a pencil and little pad of paper. Today is our last day away arriving home. We are spending the night in the quaint little town of Freeport in Maine. It's a fun town with lots of shops and the ever popular LL Beans. Very near our hotel, was a cute little quilt shop called Cotton Weeds Quilt shop and I spent a half an hour browsing until the shop closed for the day. It's has more books than I've ever seen before. I bought this fun little Nancy Halvorsen scissor fob book and a fold-up seam ripper for my travelling sewing kit. Now I can't wait to get home to my stash to make up some of these sweet sewing needle cases, kits, and fobs of course. Just have a look at the pictures in the book. As our snowbird trip comes to an end, I just had to make a final order with Amazon. Our research begins on where we will travel this fall. We might head back to Europe for a week in Paris, then off through the chunnel to spend a couple of weeks in England and the surrounding area. Retirement is a rough life, isn't it! Amazon is so good at suggesting other books I might like based on my past purchases. This McCall's Fast Favorites was just to inviting, so I ordered it along with my travel books. Just look at all the nice quilts that should be quick to do up. Many of the quilts in this book have been featured in their Annual Scrap Quilt Magazine issue... But it's nice to have this collection all in one book. A couple of weeks ago, I was the recipient of a Pay it Forward from Shawkl. She sent me these beautiful hand made earrings. Thanks Karen. I've been a loyal follower of Karen since she started her 12 dozen stitches project last year. I has ever so excited to get new ideas for stitching on my Crazy Quilted Christmas socks. So, my job is to Pay it forward to 5 bloggers. 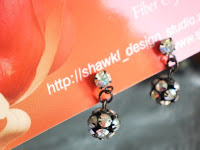 Because I've been following Shawkl for her great stitching inspiration, I have decided to give away 5 sets of hand picked sea shells that have a mother nature hole in them. These will be of particular interest to stitchers and crazy quilters who like to incorporate beads, charms, buttons, and other items in their crazy quilting. Here you can see how I incorporated a small shell into Baby Aurora's Crazy Quilted Sock. 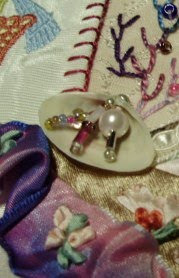 In a few weeks, I'm going to show a few more projects where I incorporate shells in my stitching. 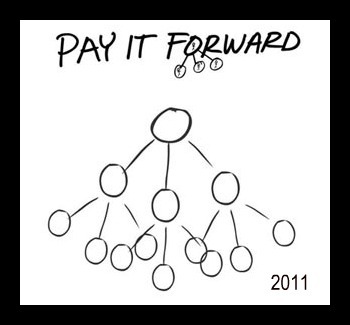 So if you are a blogger, and you would like to participate in the Pay-it-forward give-away, have a look at the rules here.... If you are still game, please leave me a comment. Here's a picture of what you'll get for your CQ stash if you are one of the first 5 commenters. Be sure you leave your email address so I can contact you for your mailing address. I will mail on Tuesday. I'm almost finished a cute little wall hanging for our quilt show at the end of April. The name and theme of the show is "Thoughts of Spring". I thought I'd make this whimzical little pattern from "Don't Look Now". All I have left to do is to hand stitch the binding down. Since I never brought any heavy hand quilting thread with me to SC, I'll do that when I get home late next week. I'm so pleased to announce that a new Grandmother is on the way. It's my sister, also known as Auntie Donna.... She will be called Grammie too, just like me. See, her youngest daughter Michelle and her hubby Scott, are expecting a little baby around Halloween! Can you imagine how fun this little baby's birthday parties are going to be? Costumes, spider cupcakes, gummy worm cakes not to mention the fabulous pumpkin cookies. Congratulations Scott and Michelle! We're all so excited for you. I mentioned before, that one of our daily activities is looking for sharks teeth to bring home to the kiddos. We have found two so far and they are spoken for by Caitlin and Grace. Emily said she'd like to have the next one, and today, Grampie found one and here it is... Isn't it beautiful! Here is a little video I took of him. He's the one that is scouring the beach, not the one para sailing.